programs in easy-to-read visual displays. PTG’s Training Evaluation Measurement for Performance Optimization (TEMPO®) software provides all the functionality needed to create survey evaluations and to track the results. 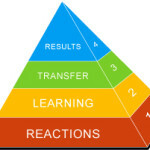 With TEMPO evaluations, all four levels of the Kirkpatrick model can be captured for reporting and analysis. ROI data collection using models similar to Phillips ROI can also be customized to the client’s thresholds. Data can then be passed into PTG’s Learning Dashboard Suite for instant analysis. See the results of your program efforts in real-time graphical displays that provide easy viewing of trends and the story of successes and challenges.